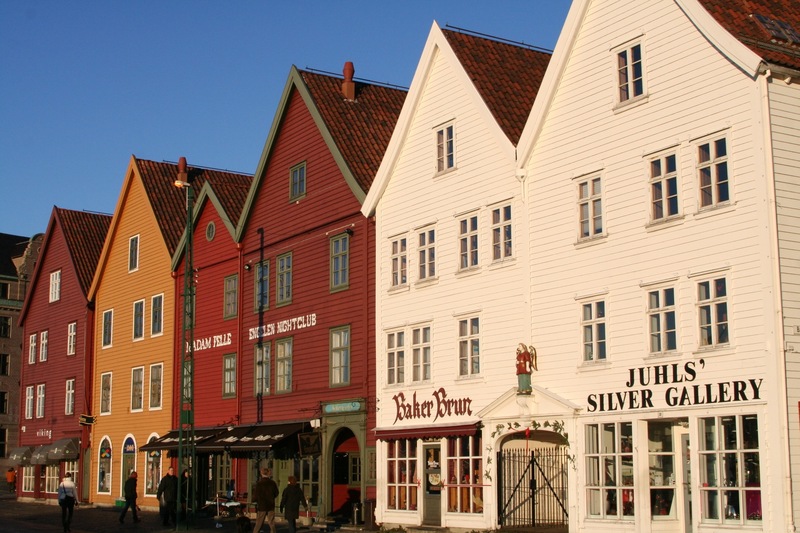 Bergen’s history can be traced back over a thousand years to the early part of the last millennium, when it was founded as a trading post ideally positioned on a wide fjord sheltered from the North Sea by several islands. 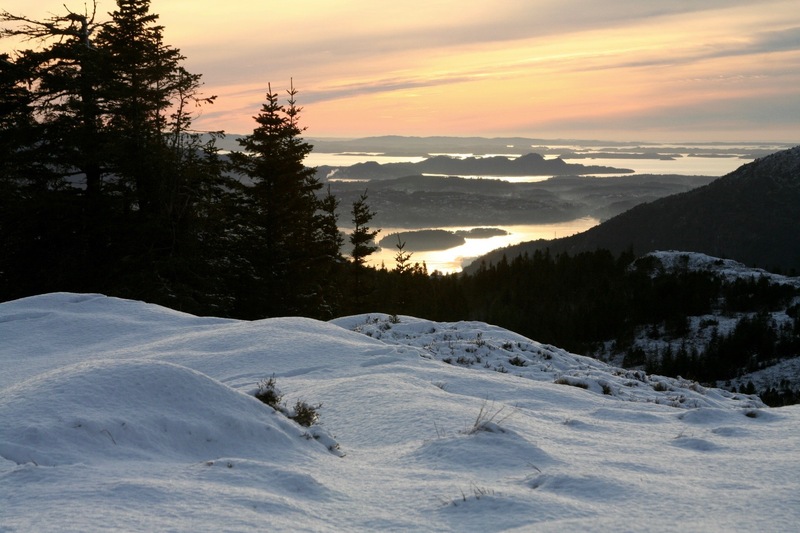 Viewed from the top of Blåmanen, one of the seven mountains that dramatically surround Bergen, it is an awe inspiring sight. This location made the city an important European hub for trade and commerce – in the 13th century Bergen became part of the Hanseatic League, the powerful federation of guilds and cities that dominated European commerce for 400 years. 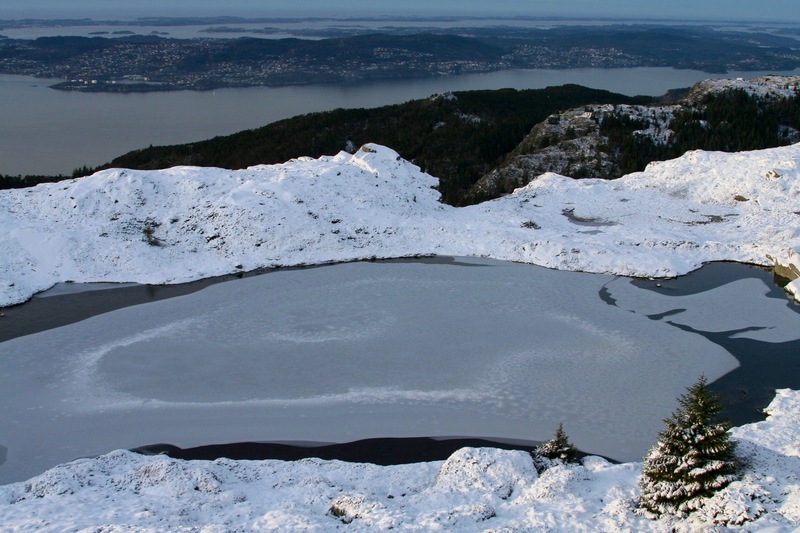 From humble origins Bergen grew, and grew wealthy. 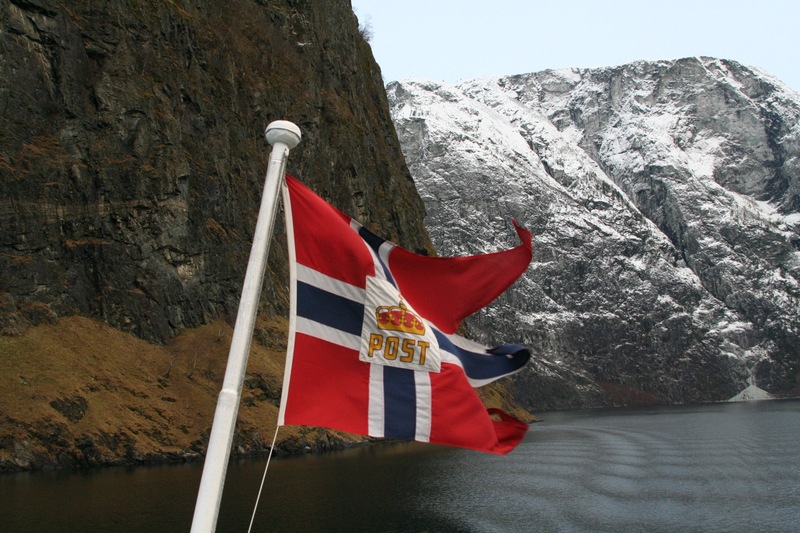 At one time even becoming the capital of Norway until that title passed to Oslo. 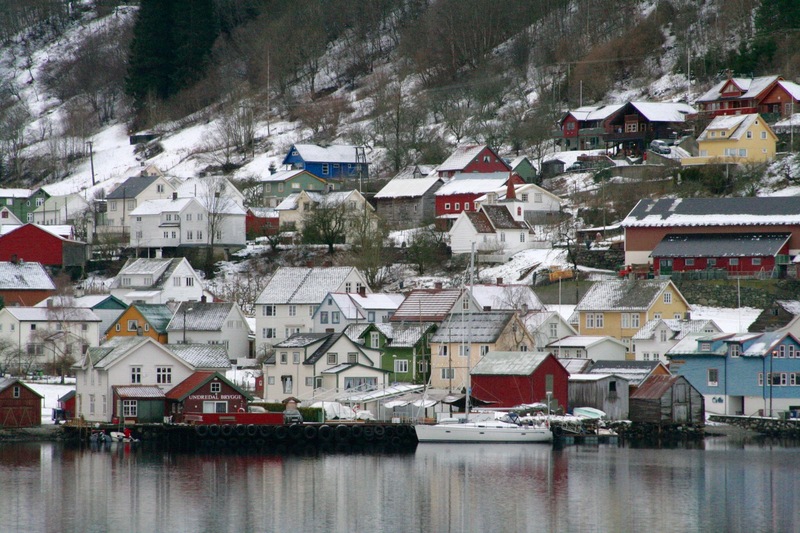 Even after it became Norway’s second city, Bergen continued to grow in importance and wealth. The trade in fish, particularly dried cod, was its major export, and fish from Bergen was sold all over Europe. 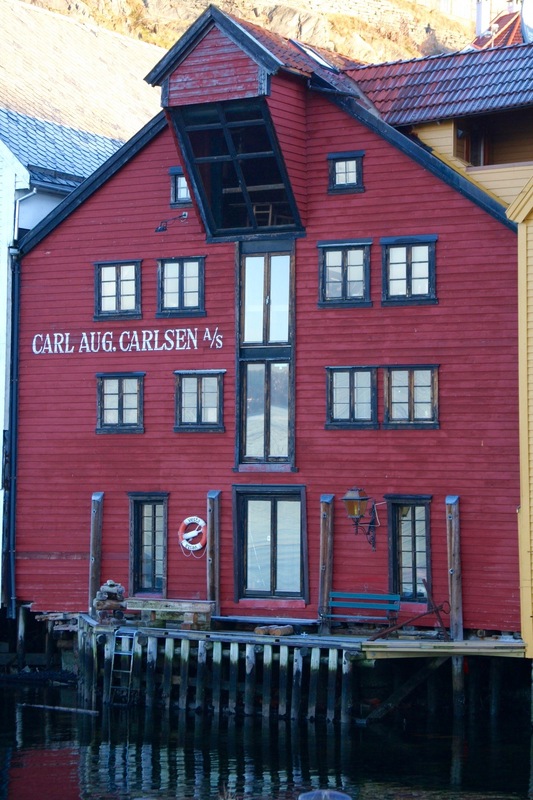 The legacy this trading history has left behind, is best seen in the atmospheric jumble of brightly painted wooden buildings that today make up the UNESCO World Heritage site of Bryggen. Blue skies and sun greeted us as we left our apartment in Bergen’s Skuteviken district. 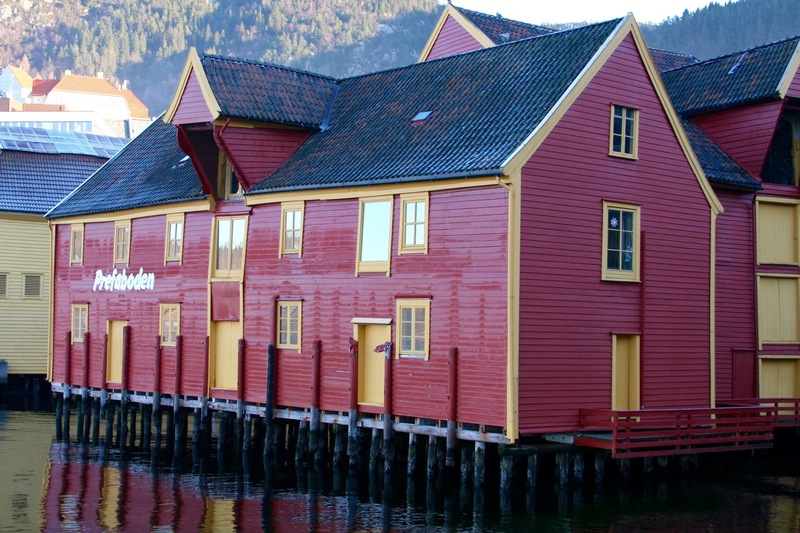 We were headed to Bryggen but took some time to wander around this historic area, which dates from the 16th century. Skuteviken is more residential than Bryggen, and offers a glimpse into the everyday lives of people away from the tourist centre of the town. In the cold morning air we walked through cobbled streets past wooden houses to the waterfront, where beautiful wooden warehouses sit on stilts above the water. 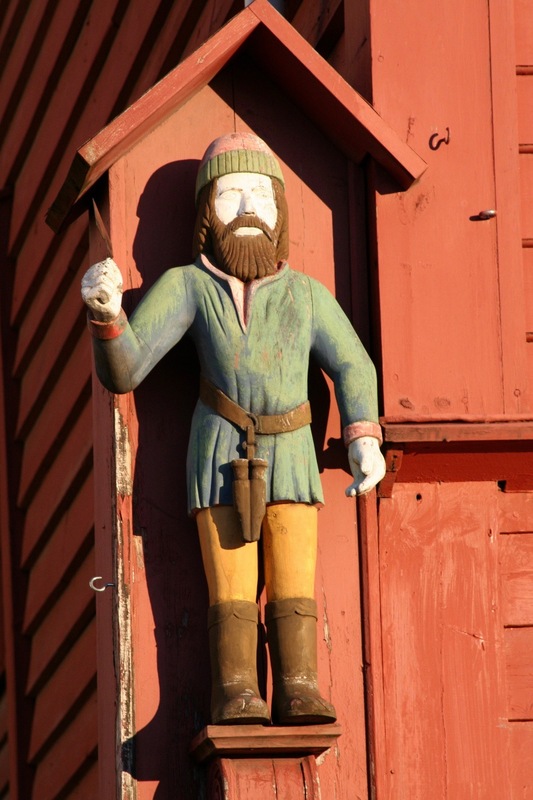 A stroll through the grounds of Bergenhus Fortress brought us to Bryggen. Bryggen is the historic old port and warehouse district of the city, and it’s little short of a miracle that it even exists. Ever since the first buildings were constructed here it has been repeatedly burnt to the ground by fires. One fire, in 1702, reduced the entire area to little more than ash. 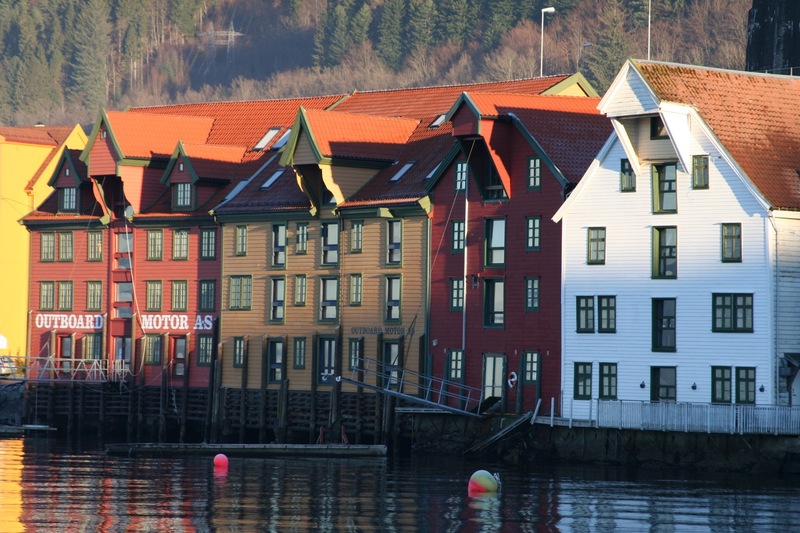 After each fire the good citizens of Bergen rebuilt the district, although no one seems to have considered using something less flammable than wood as a building material. 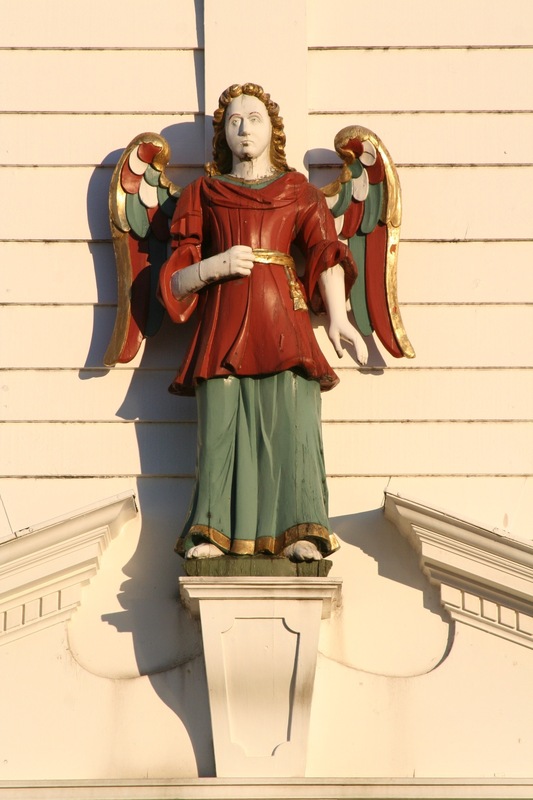 Today, numerous buildings from different periods of history remain to be explored. Most of them are shops, cafes and restaurants. The area is pretty commercialised, but still retains a lot of charm. We wandered through its attractive alleyways on wooden walkways getting a sense of the cramped living and working conditions of the district. It was still bitterly cold despite the sun, so we stopped for a reviving coffee at one of the many cafes before visiting the Bryggens Museum. The museum is built over the remains of the earliest 12 century settlement at Bryggen, the excavations beneath the museum are fascinating. Afterwards, we headed to the Fløibanen, a marvellous funicular that takes you out of the city centre to a viewing platform on the mountain of Fløyen. It’s a fun way to get brilliant views over the city without having to hike one of Bergen’s many steep hills. As the funicular train chugs up the hill vast panoramas of Bergen and its surrounding hills and fjords reveal themselves. It’s fantastic. 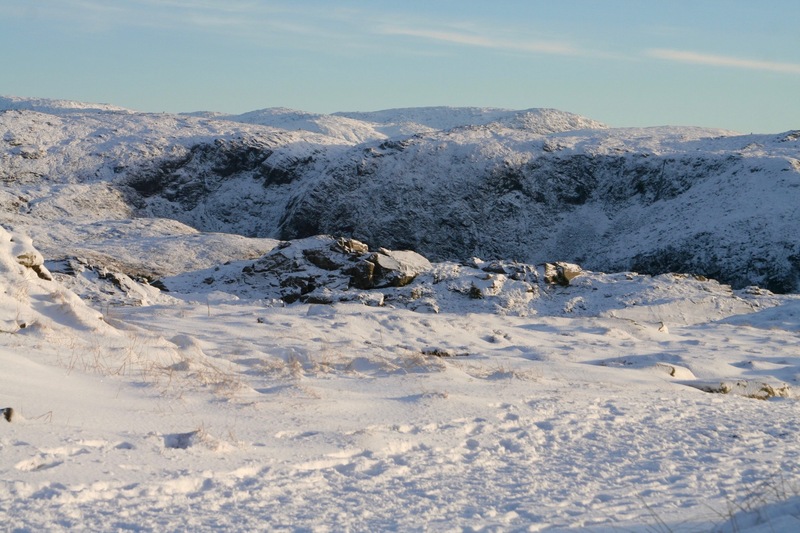 Several walking routes start at Fløyen and, since the weather was bright and sunny, we decided to hike up Blåmanen. Climbing upwards, there was more and more snow, and the air temperature dropped considerably. At the top of the mountain it was a little like standing on top of the world; if the top of the world has been dusted by snow.. 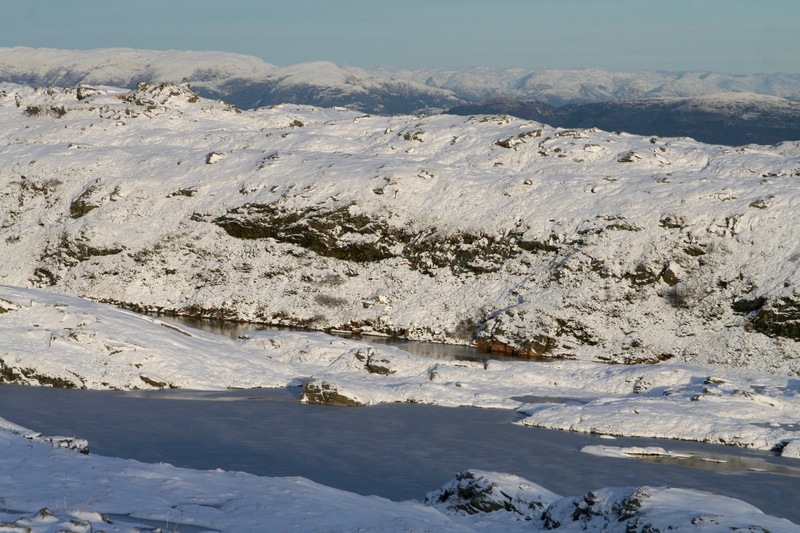 The views across the mountain ranges to the east were magnificent; westwards, the views to Bergen and across the fjords were nothing less than spectacular. 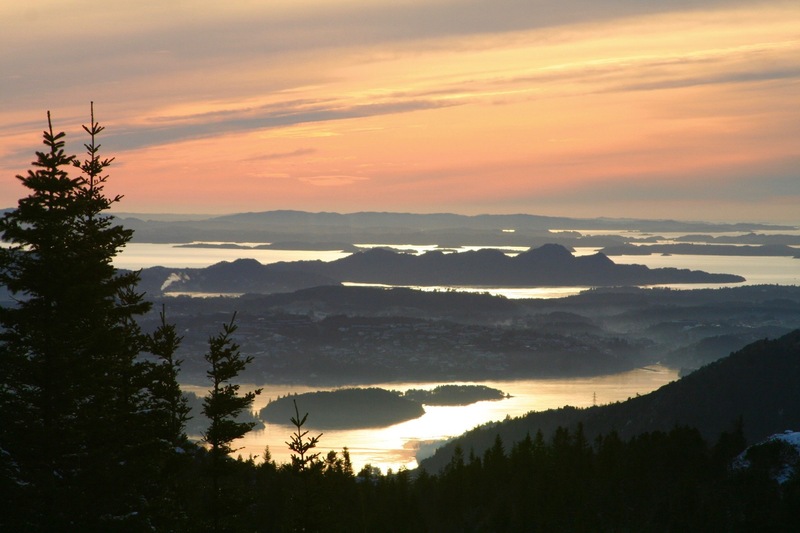 As we made our way back down the mountain, the sun started to set, illuminating the fjords as red, pink and orange light streaked the sky. It was achingly beautiful. Winter arrived with a vengeance this week in northern Europe. Heavy snowfalls and freezing temperatures have swept across the region causing disruption bordering on chaos for the last few days in the Netherlands. I couldn’t have chosen a worse time to return from a month-long trip to Argentina and Uruguay, where temperatures of 30ºC and deep blue skies were daily companions. 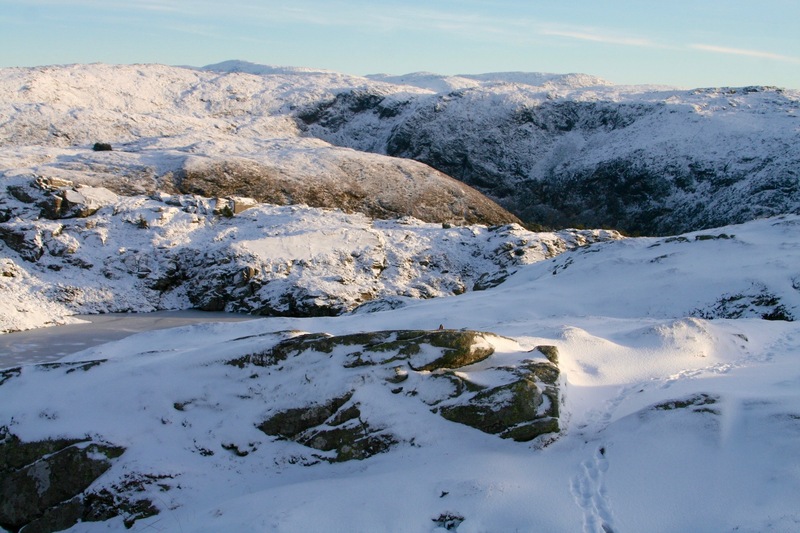 The weather put me in mind of a previous trip to Bergen in Norway in the depths of winter. On our first day in Bergen we were greeted by fierce winds and horizontal rain, the town seemed nothing but grey, cold and miserable. We popped into a local bar to take shelter from the weather and cheer our gloomy spirits, only to realise that Norwegian alcohol taxes don’t allow for gloomy spirits to be cheered. At least not by much. The frenzied buying of duty free alcohol by people getting off our plane at Bergen airport suddenly made a lot of sense. Bergen is a pretty town situated in a fantastically picturesque area of western Norway, it’s also notorious for being one of the wettest places in the country. As we ventured back into the streets we were battered by more rain and wind, but made our way to the tourist office to discover what indoor activities were available in case it rained for the entire weekend. The tourist office staff were clearly used to damp tourists showing up looking for hope, and they cheerily told us the weather would improve. We booked a trip to nearby fjords for the next day. The Norse Gods smiled on us and, as we headed to the train station for the first leg of our trip, the weather was bitterly cold but dry. There were even occasional spots of blue sky. The Norway in a Nutshell trip is less a tour and more a well connected set of public transport. 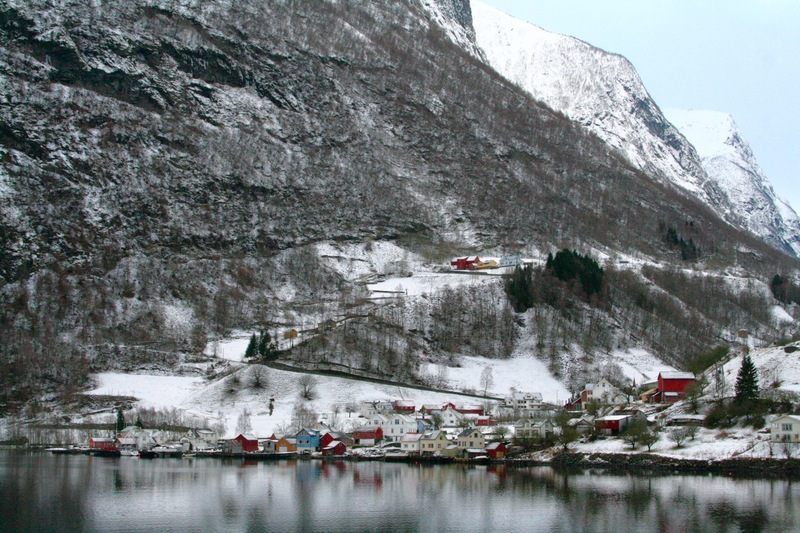 It takes you on a train to the town of Voss, a bus then drops you at a harbour at Gudvangen. 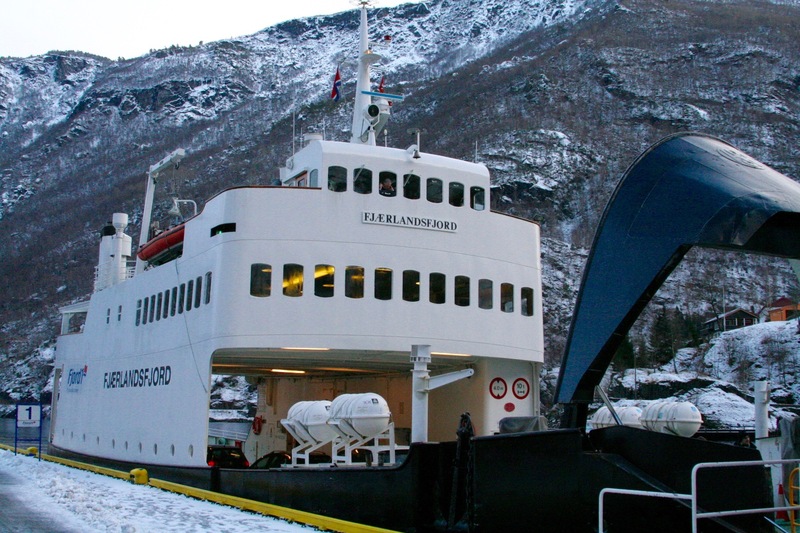 We boarded the M/S Gudvangen for a two-hour cruise along Nærøyfjord, an UNESCO World Heritage protected landscape that is outstandingly beautiful, until we finally arrived at the tiny town of Flåm. 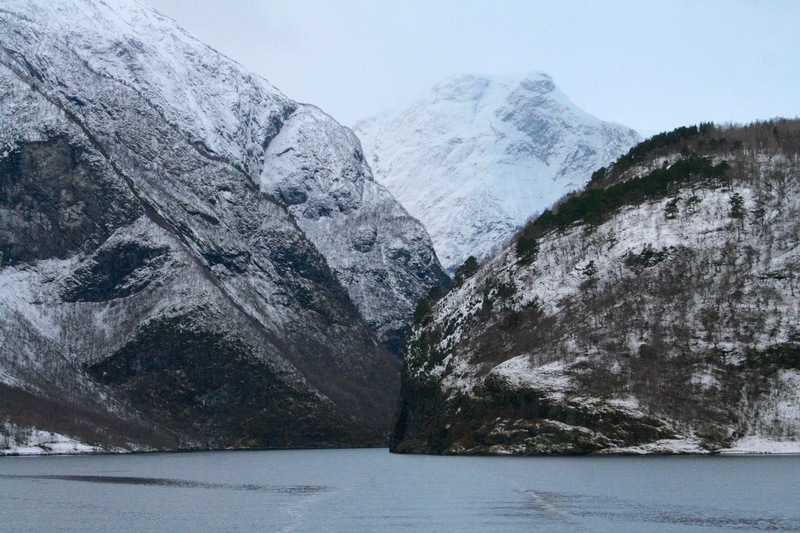 The journey through the fjord was little short of spectacular. 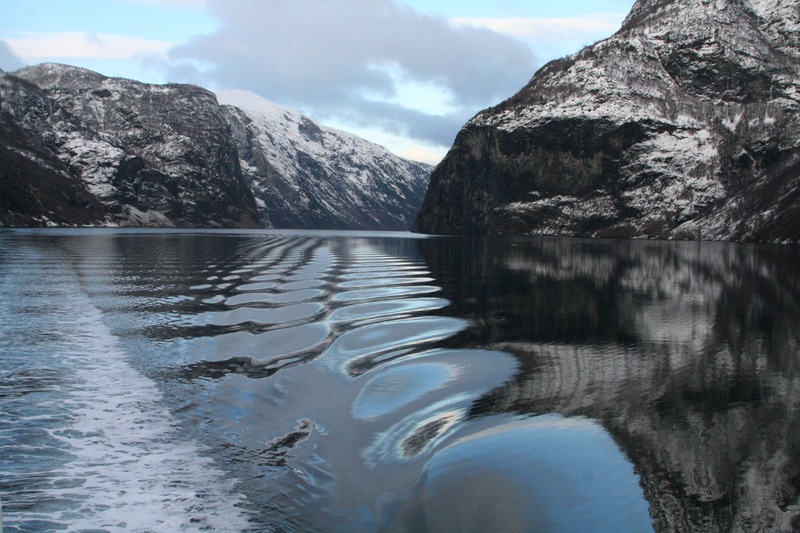 The Nærøyfjord is famed as one of the narrowest and most beautiful fjords in Norway. 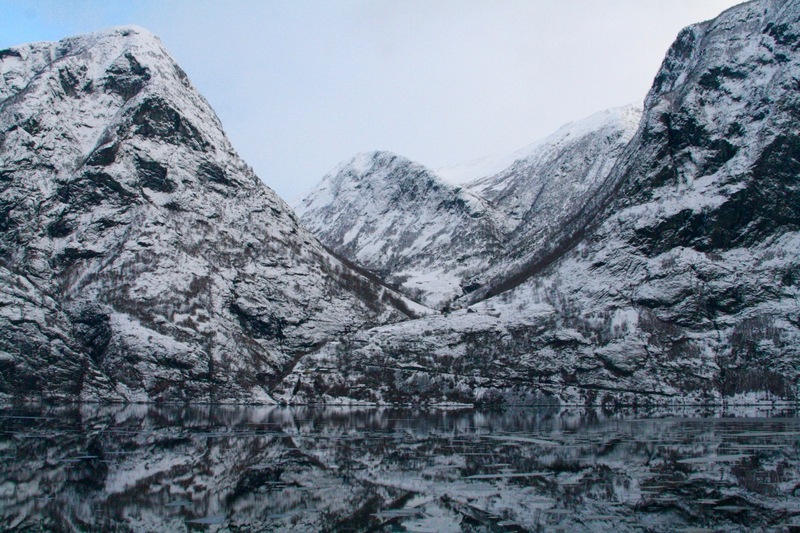 It’s towered over by vast mountains, their massive bulk reflected in the dark waters of the fjord. 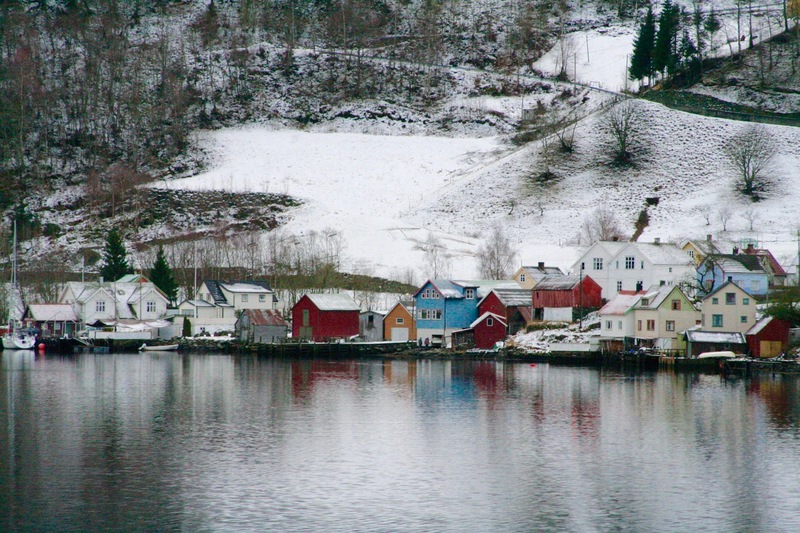 Dotted along the banks of the fjord are a number of tiny villages with brightly painted houses that, especially in winter, seem like the most isolated communities on earth. The landscapes were truly amazing, and I’d have spent more time outside taking photos but for the fear of freezing to death. It was incredibly cold. 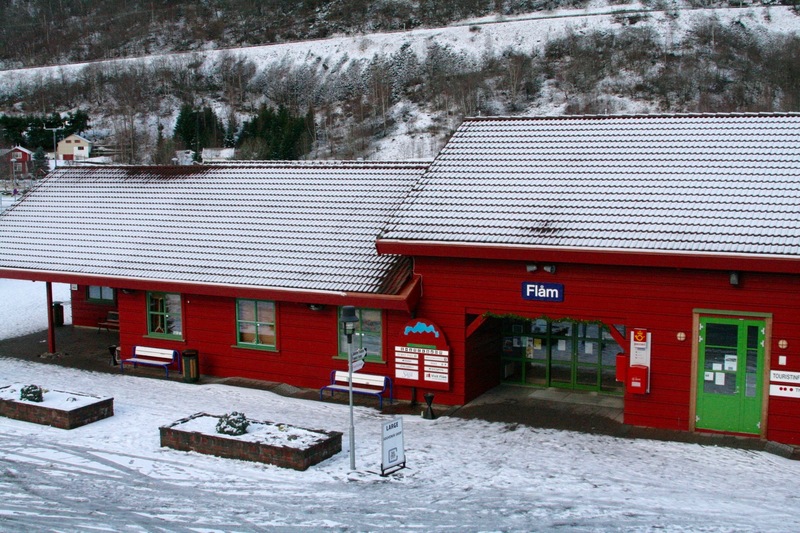 The penultimate part of the trip is a 20km train ride connecting the village of Flåm and the railway junction at Myrdal. This is one of the steepest and most famous train routes in the world. We had a short time to regain our land legs before getting on the train and starting the zigzag ascent up the mountain. The train makes a short stop at Kjosfossen waterfall, which probably looks more dramatic when there’s less ice, before depositing you at Myrdal. We had a short wait on the snowy platform before a train arrived to take us on the two hour trip back to Bergen. 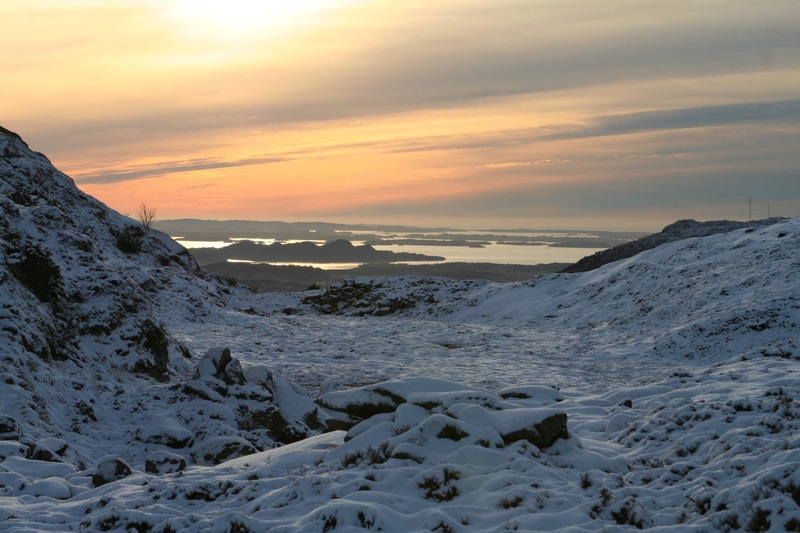 This being Norway in winter, it was already dark before we got on the final train of the day. 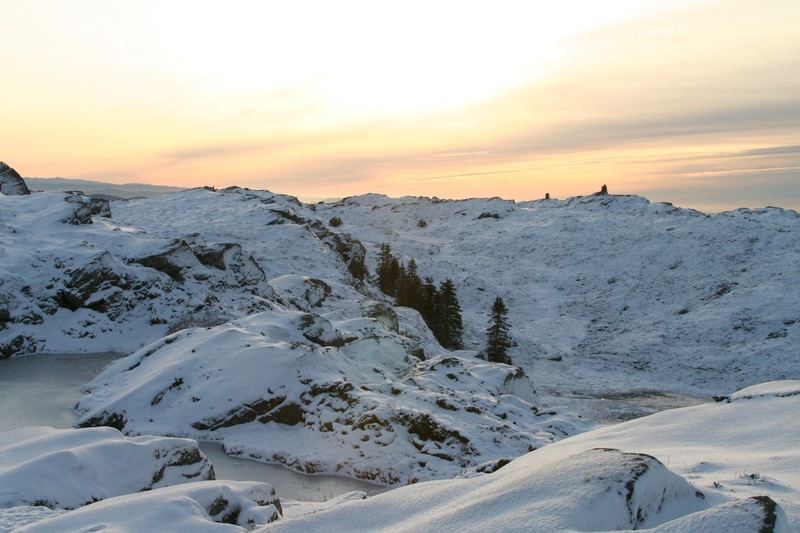 Bergen is known as the gateway to the fjords, but in winter most of the trips that you can do aren’t available, all except the Norway in a Nutshell trip. The trip takes most of the day – you start in darkness and end in darkness – and despite the cold, it’s a great introduction to this beautiful and extraordinary region. 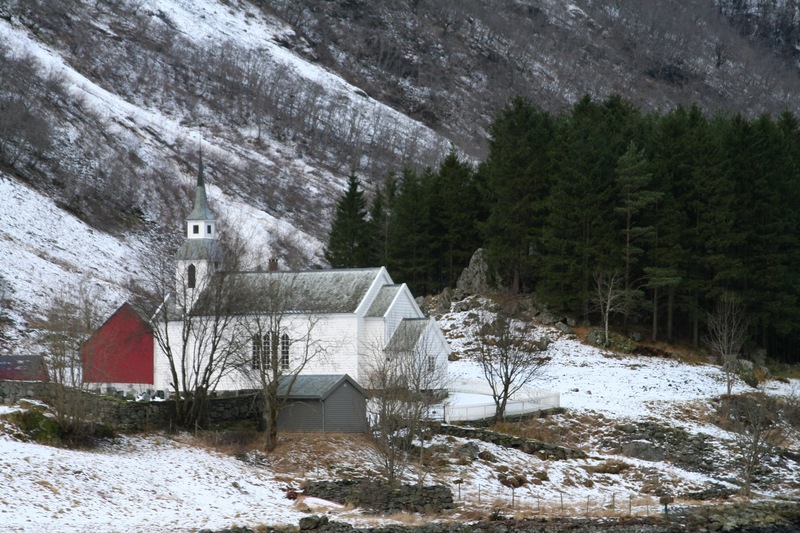 It certainly made me want to return in warmer weather and take a few more trips through Norway’s fjords.